Loved this Safavieh Handmade Natural Fiber Barbados Chunky Thick Jute Rug - 8' x 10'! Looks great in any space. The material is also very durable against constant foot traffic. Safavieh Handmade Natural Fiber Barbados Chunky Thick Jute Rug - 7'6" x 9'6"
This rug is actually jute not sisal. The description says sisal weave which is accurate but if you want a sisal rug this is not it. On the good side, it is very soft and thick. It would go well in a casual setting. On the downside, it contains an extraordinary amount of dust. If you or family members are allergic....beware. I returned it because I wanted sisal and hated the dust. The rug is the perfect color, thick with a nice texture. Very well made. I liked it so much that I bought another one for my family room! Love the color and quality of this rug! The negative reviews are true. I read the reviews and decided I'd give it a try. Bad idea. Looked great at first. Received many compliments. Had a very strong odor that remained. Can't be vacuumed without knots coming unwoven and I use a Dyson. Sheds really badly. I have dogs but noticed I would have to vacuum ever other day due to huge piles forming in corners and under furniture. Its natural fiber also sheds a dark dusty film under the rug. So you have to regularly roll up the rug and clean underneath. Only had for 7 months and it got tossed to the curb. It's a very thick rough rug. One side has deeper knots which should've been the topside. These knots made it uncomfortable to sit on and walk across. Couldn't walk across in heels or it would snag the knots. The fibers also cover your clothing if you lay or sit on it. Hard to get off afterwards. Very rough with sharp pieces in the knots. I have a 1 year old and it wasn't a material I would've preferred. It looked great for the first couple of months until the knots starting coming undone and you have to roll them up and tuck them back in constantly. It was able to handle many spills without leaving rings. The price was the why I purchased it but looking back I would pass on this one for a higher quality. Maybe something with a thinner pile thickness and mixture of cotton/chenille/jute or and indoor/outdoor jute. Ok :) I have purchased from O maybe 10x's? It seems that most items are a let down- either with quality, color, paint. I have bought 4 rugs from overstock. One rug I thought was plush- ended up being flat weave. Another very expensive rug's colors were extremely muted, darker than described or shown AND one corner was much lighter than the rest. 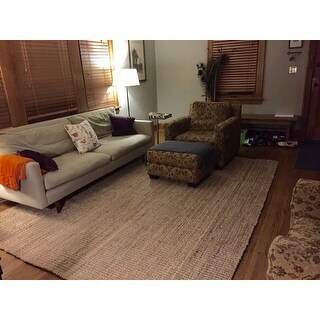 The third rug's colors were completely off what the site showed. It showed beige and I got chocolate, AND had a 3 in. circle of some blue/green substance dried on to it! I tell you all of this to let you know that when I say this rug is fantastic- it really is! It is JUTE, not sisal. I know this because the rug comes with a care label attatched which stated it is 100% jute. It is a thick rug- 1/2 to 1 inch thick? Nice- however a door might not open over this rug or office chair wont roll ( something to consider). It does have a strong earthy smell to it, which I actually really enjoy because it reminds me of gardening, however I am sure some would find it off. I am sure the smell will dissapate over time. Care instructions say not to have direct sunlight on it. (I dont know why). I love this rug- absolutely worth the money- it is beautiful. Great rug! This is the third Safavieh Jute Rug that I have ordered. 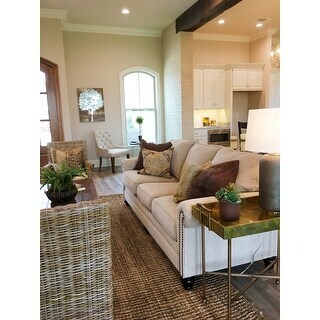 Should I need additional rugs of this nature it will be from this vendor and Overstock. The color in the picture is true and for a jute rug, the quality is fabulous. I read a lot of the reviews and was a little discouraged about buying this rug because of the negative comments. But after taking the chance, I'm SO glad I did!! 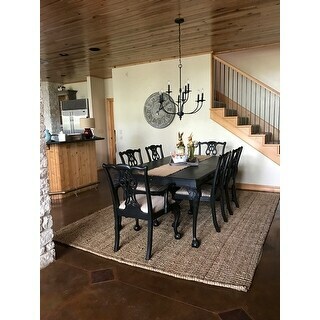 I've purchased various other jute rugs from Rugs USA, and Ashley's Home Furniture and this one is actually the best quality and price! If you have never owned a jute rug, you will be a little surprised by the smell and shedding, but I promise, the smell goes away and the shedding is much lighter over time. It's well worth it if you want a durable, quality rug with a beautiful look. I prefer this type of rug over any others because they are long lasting and great for high traffic. I have two messy kids under 3! I wouldn't recommend vacuuming these rugs with a high suction because it can unravel the jute. I would recommend shaking it out outside and then lightly vacuuming it with the hose rather than the full vacuum head to keep everything in tact. Overall, I'm very happy with my new rug and would highly recommend it if you are looking for this style! I purchased the 8x10 and it's perfect! After holding this rug in my shopping cart for months, literally, I finally decided to go through with the purchase last weekend. It only took a few days (less then a week) to arrive and I was so excited to see it on my front porch. I am so thankful that we have a covered porch because we had substantial rains all day that day, and I was at work when it arrived. The rug was safely sealed in thick plastic wrap and left in a dry spot on the porch floor. I attempted to move it into the house and unwrap it myself, but it was too heavy for me (sorry FED Ex guy! ), and so I had to wait for my husband to get home and help. This rug unpacked and unrolled pretty easily, and laid flat on the floor immediately. I absolutely love this rug - it brings so much warmth and interest to our previously bare living room wood floor. It's very thick with a fairly large chunky or nubby texture that feels great on your feet. I'm waiting for the felt rug pad we bought to go underneath it, which is supposed to be delivered today. I know that will protect the rug longer, as well as add to the springiness under foot. The one surprising thing about this rug, is that it has a strong, natural fiber or grasslike smell that took a few days to dissipate. It smelled a bit like a damp basement. (I also have a particularly sensitive sense of smell, so I might find it more offensive than most.) Now that the rug has been unrolled and in our space a few days, the smell, while still faintly there, smells much more pleasant and MUCH LESS like a basement. I would absolutely purchase this rug again, and recommend it to anyone. This rug is just what we were looking for! 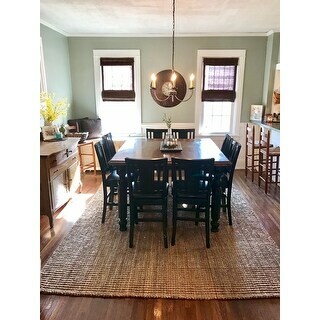 I painstakingly read the reviews of every 8x10 jute rug on overstock and took a leap with this one. The other reviewers are right - this rug is soft and the color is just as pictured. Would highly recommend this carpet for those looking for a natural fiber rug! I ordered this rug in two sizes for my house. Love the color, which is light to medium straw color. Heavy, thick weave. Good quality with a reasonable price tag. Nice, soft underfoot but repeatedly sheds dirt! I've had it for 20 months and the edges are stretching and the weave is beginning to come apart. Also the black dirt still sheds onto my hardwoods, kind of nasty! GREAT looking rug! Exactly as pictured! Was nervous buying a rug online, but decided to pull the trigger when it went on sale over Labor Day and I'm glad I did! Yes, this rug does shed some, but that's the nature of these types of rugs and it's under the rug, so it's not like people can see it! I haven't had any issues with snags and I have received many compliments from family and friends. Overall very pleased! ***REVISED*** Ok, I spoke too soon. Although I still think the rug is pretty, I have had MANY snags with this rug!!!! In fact I just looked and I now have 5 more places that I have to fix. This is on top of the 10 or so that I have already fixed. I'm able to get the snags to look somewhat like the original braiding, but not exact and it's a total pain to do. I ended up have to use a knitting needle or something similar to fix. I find it makes "re-braiding" easier. For this reason, I am adjusting my stars from 5 to 3.
i ordered this on overstock and it came really fast. The rug is much better than expected and beautiful. I normally think natural fiber rugs are hard to the touch but this is very soft!. I am using it as a base and put our cowhide rug on top! While the chunkiness and texture of this rug appears to be very "Fixer Upper" ish, this is the most disgustingly, filthy rug..impossible to clean! The jute fibers are all over your clothes, socks, baby's pacifiers, travels to the corners of your flooring. It's similar to fine cat hair that is a magnet. Oh, and just check your vacuum after you use it. It gets completely filled up 1x cleaning it. I decided to return the rug, so when I called to return it, the shipping was *** but the rug was HUGE so I thought I'd go ahead and try to sell it myself and discount the *** since I would be eating that cost anyway. After I sold the rug, the individual came to get it and as I had rolled the rug back up to have ready for pick up....(makes me disgusted even saying this), there was a baseball diamond of DIRT under this rug. No wonder why my vacuum was always gross. Needless to say, I gave the rug away for free because there is no way I would ever want to give somebody something so filthy. Afterwards, I felt terrible I even bought the rug...one my children has really bad allergies and that rug was probably holding everything under the sun in the fibers. Overstock should pay me to buy that rug. I absolutely love this rug! It is beautiful and I would recommend for others to buy. It is nice and thick as well plus the price is not bad either. Love this rug! I read a previous review which mentioned a smell and find that interesting as we did not have that experience. In addition, I have vacuumed this rug with no issues. We have been very happy with this rug. I purchased this rug to go under our dining room table. I love the different colors running through the rug. The only downfall to this rug is if you spill something on it, you can’t really clean it. I love this rug! It was perfect in my daughter's guest room. I was surprised at how soft it is and the color is great! We looked at so many rugs and this was a really good price for such a nice rug. The color is perfect, the feel is great, we did a beach/tropical theme and it came out fantastic. The rug arrived super quick which kept or project on track. The price is fantastic, buy it!!! Nice for price. Good quality! Thick, chunky, lots of texture. This is a great way to set the stage for a living room where you want a timeless material, some texture but not a lot of pattern. I find jute and sisal to be so easy to work with. You can always layer a kalim or a cow hide over them. I like the relaxed vibe this work has. "Can I use a vacuum with a beater bar on this rug? My vacuum does not have the option to turn it off." We strongly advise against engaging the beater bars as this can loosen and pull the fibers. "How does this rug stand up to getting vacuumed? We have a Dyson vacuum cleaner. It has a strong pull. Also, will my dogs' nails pull on the knots of the rug? We have two medium sized dogs and worry their nails will get caught on the rug. Its appearance & color are perfect for what we want but are worried about those two situations." The rug is thick and heavy and feels good to walk on barefoot. Your dogs will go nuts for it because it smells like fresh hay, which I find pleasant and the smell fades within a week or so. The weave is tight enough that it shouldn't snag your dogs nails, but they may try to "dig" in it which may cause some snags. I use mine in a guest room, but I 'm sure it would be durable in a more high traffic area. Good luck.
" I love this rug and I love the quality. And I have it on my hardwood floors with the pad underneath it. But I do have a question I have two areas on the rug where it has pulled up. I don’t know how else to explain it it just looks like two pieces came out of the rug and his bunched. I just received this yesterday and I certainly don’t want to have to send it back but I want to know if this is going to happen with other pieces of the carpet?" I cannot imagine why this rug is bunching. Mine has been on a covered outdoor patio with a light pad under for several months and lays beautifully - very flat and symmetrical. Suggest you remove all furniture from rug and hand-stretch it smooth. If it still bunches mist a little water over those areas and stretch again. When flat and dry return the furniture without sliding, but lifting directly over when you want it. "I have a heavy coffee table. Will this carpet bunch up around the legs of the coffee table? I'm concerned because other thinner area rugs do." No, it shouldn't bunch up especially since your table is heavy. You might have a problem if your coffee table has legs, and not just a base, if you have legs on your table, it may sea saw around because this rug is very textured. I hope this helps. I love this rug! I had this in my family room under a heavy coffee table also. The rug did not give way. The coffee table legs kind of made indents in the rug since the rug has some natural lows. It needed to be re-positioned only rarely. Unfortunately, we cannot guarantee that this rug will hold up to heavy furniture- it would depend on the weight and size of the table. "Is the jute hard and scratchy?" no. soft and comfortable to walk on, easy to vacuum and clean. LOVE IT AND IVE USED IT IN SEVERL ROOMS INCLUDING KITCHEN. "What is the return policy on this rug?" For detailed on our return policy, please see- https://help.overstock.com/#!/answer/1. "What is the weight of the 8x10 rug?" The approximate weight is 64 lbs.